The Society of St Vincent de Paul said it expects no slowdown in the number of calls for help it receives from families and individuals struggling to make ends meet. Two months ago, SVP National President Kieran Stafford reckoned that the Society would receive about 50,000 calls for help over the winter months. That estimate is set to be significantly exceeded, given that the SVP has already received almost 50,000 calls from desperate people in the months of November and December. At present, in Ireland, the Society receives more than 130,000 calls for assistance a year – about 11 per cent more than it did five years ago. The main request it receives from families struggling on inadequate incomes – whether they rely on social welfare or have employment – is for help with the cost of food, fuel, education and utility bills. “We are also increasingly receiving calls for help from people unable to meet growing costs of private rental accommodation and being forced to make choices about the use of scarce income,” said Mr Stafford. In 2019, the Society of St Vincent de Paul will be marking the 175th anniversary of its foundation. The society was established in Ireland 11 years after Blessed Frederick Ozanam convened the first meeting of the Society in Paris in 1833. Over the 175 years that it has been in existence in Ireland, the Society has helped people in the direst of circumstances because of the Famine, the War of Independence and the Civil War, the “hungry 30s” resulting from the worldwide depression and the Land War with Britain, the deprivations of “the Emergency” during World War 2 and the Irish economy’s repeated austerity cycles. 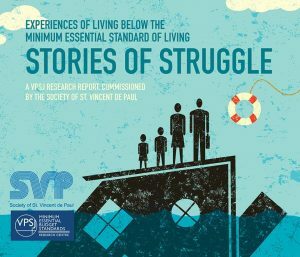 Today, in addition to providing direct assistance to those in need, the SVP manages 10 hostels which provide emergency shelter to homeless people, provides nearly 1,000 units of social housing, operates five holiday homes, seven resource centres, four prison visitor centres and 224 charity shops. It also operates a Young SVP programme in schools and third-level colleges. “The SVP is committed to identifying the root causes of poverty and social exclusion in Ireland,” said Mr Stafford. “In solidarity with people experiencing poverty and disadvantage, we advocate and work for the changes required to achieve social justice and equality of opportunity for all citizens, and to create a more just and caring society. “Often those who ask for help are viewed as somehow the cause of their own misfortune, but those who struggle to avoid or escape poverty deserve our support and empathy.